Volkswagen has revealed its facelifted Golf. The updates will cover the entire Golf range: the three- and five-door hatchback, the high-performance GTI, plug-in hybrid GTE and Golf estate. From the outside, things still look decidedly ‘Golf’, but those in the know will have clocked the few small changes VW has made. 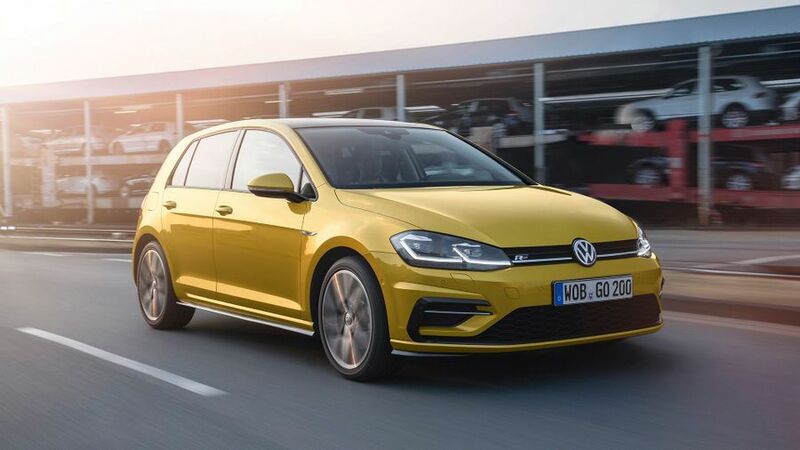 There are new bumpers at the front and rear, new halogen headlights with LED daytime running lights, full LED headlights on some specs (gone are the xenon headlights), new front wings, and new full LED rear lights – which will come as standard on every version of the Golf. There will also be new wheel and colour options, with those colour options extended to the interior in the form of decorative trims and fabrics, including door panels, the dash panel and the centre console, as well as new seat covers. The sporty GTI and GTE versions will get specific colour details: red for the GTI, and blue for the GTE. 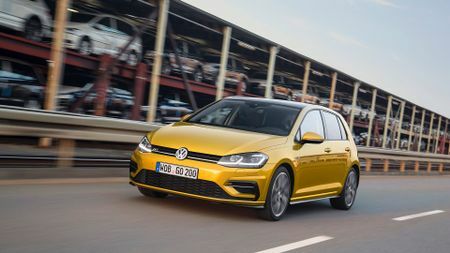 The biggest changes to the facelifted Golf are found inside the cabin, with updated infotainment systems across the range. There are also larger touchscreens (6.5-9.2-inches), and for the top-of-the-range ‘Discover Pro’, gesture control – which is the first time the technology has been used in the compact car class. Drivers will be able to swipe to move horizontally through menus, scroll, change radio stations, flip through playlists or go through photo albums. There will either be visual interactive feedback, or a sound effect to confirm successful swipes (although you can turn that off if it’s annoying). The instrument cluster is digital, with everything displayed on a 12.3-inch colour display. There will be five different information profiles to view, which rearranges what is shown: Classic, Consumption & Range, Efficiency, Performance & Driver Assistance, or Navigation. Drivers will be able to use VW’s App Connect to connect Android, Apple or Google smartphones. 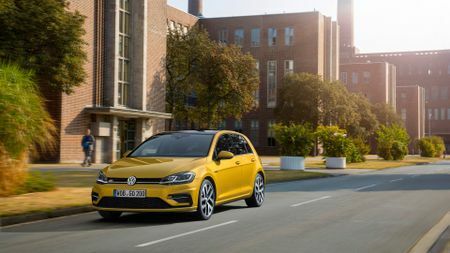 In terms of safety equipment, the Golf is still packed with plenty of systems, including the new traffic jam assist, pedestrian monitoring for front assist with city emergency braking, trailer assist (the first in the small car class), and emergency assist. 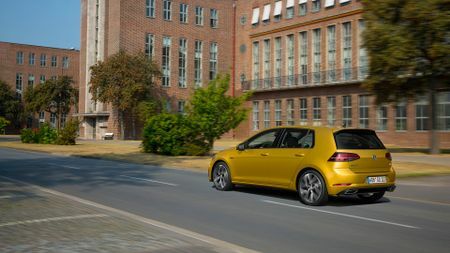 Traffic jam assist allows the car to partially drive itself, which combines several of the Golf’s assistance systems to avoid rear-end collisions, as well as steering, accelerating and braking automatically. The driver does have to keep their hands on the steering wheel at all times, though. There will be a range of petrol and diesel engines available, from a 1.0-litre three-cylinder petrol engine, up to the 2.0-litre four-cylinder petrol engine in the GTI model, which has a 10bhp lift in power up to 227bhp. For diesel, the Golf will be available with the recently revised 1.6 and 2.0-litre turbocharged four-cylinder engines. Volkswagen is debuting its 1.5-litre, four-cylinder turbocharged petrol engine in the new Golf, which develops 148bhp and emits a claimed 110g/km of CO2. There’s also a BlueMotion version in development (a variety of technologies which aim to reduce fuel consumption), with 128bhp and 104g/km CO2. VW has also developed a new 7-speed dual clutch gearbox which will eventually replace all the 6-speed dual clutch gearboxes used in the Golf to date. This facelift is designed to help keep Europe’s best-selling car looking and feeling fresh until the all-new re-engineered Mk8 Golf is launched in 2019. The facelifted model will go on sale in 2017, and should be priced similarly to the current model, which is from £17,500 to £34,000.